Chandrikaben comes from a family which has practiced Mashru-cotton crafts for generations in the Pattan district of Gujarat. Mashru cotton is known for its characteristic appearance of shining silk with the soothing feel of cotton. However, changing economic times led Chandrikaben, like many others to abandon this craft, and to venture out for a stable job. 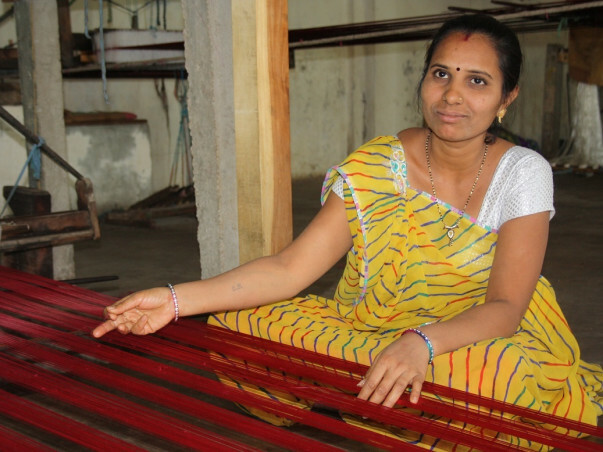 Gramshree, an NGO based in Gujarat, offered support and helped Chandrikaben get back to the craft nine years back. She spent the first three years just preparing the cotton rolls and learning to work on the equipment. Today, she spins the magic once again and makes fabrics come alive in a dazzle of colors.